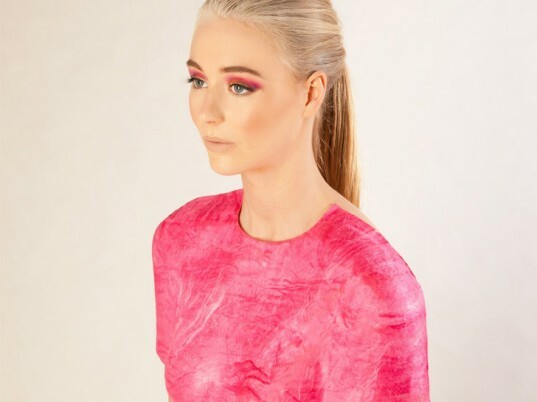 For New Zealand designer Samantha Murray, turning liquid into clothing wasn't just an audacious experiment, it was also an exercise in rethinking garment construction. The recent graduate, who developed her "Sweet Suspension" collection during her final year at Massey University, combined the shapes of classical sculpture with the "texture of gummy lollies" to create five, fruit-scented forms. “For me, this collection was entirely about the process: pushing boundaries, creating previously impossible shapes, and exploring the potential of the idea," she tells Ecouterre. Getting a solution to behave like a solid wasn’t easy, of course. After researching the spray-on fabric Fabrican, Murray invented her own “low-tech” version by binding fibers to a liquid base. It was a process that required copious trial and error. Unlike Fabrican, which is sprayed directly on the person, Murray’s technique involves pouring a solution she calls “Fiberform” into a three-dimensional polystyrene mold, which she carved by hand. Another way the two technologies differ: Fiberform holds its own shape independent of its wearer’s body. Working with liquid allows for zero waste, a shorter construction process, and minimal raw-material use. Once cast, dried, and popped from the mold like a cake, individual pieces were “welded” together, nuno-style, sans thread. Working in this medium, Murray says, allowed for zero waste, a truncated construction process, and minimal raw-material use. Another advantage? “It’s a completely unique textile that has a papery quality and can create shapes and effects not possible with conventional fabrics,” she tells us. For fun, Murray added fruit scents to the liquid solution to create a “full sensory experience,” one she hopes will leave a lasting impression. As for tomorrow, the designer has applied to the Textile Futures program at Central Saint Martins, where if accepted, she plans to take her ideas even further. Getting a solution to behave like a solid wasn't easy, of course. After researching the spray-on fabric Fabrican, Murray invented her own "low-tech" version by binding fibers to a liquid base. Unlike Fabrican, which is sprayed directly on the person, Murray's technique involves pouring a solution she calls "Fiberform" into a three-dimensional polystyrene mold, which she carved by hand. Another way the two technologies differ: Fiberform holds its own shape independent of its wearer's body. Once cast, dried, and popped from the mold like a cake, individual pieces were "welded" together, nuno-style, sans thread. Working in this medium, Murray says, allowed for zero waste, a truncated construction process, and minimal raw-material use. Another advantage? "It’s a completely unique textile that has a papery quality and can create shapes and effects not possible with conventional fabrics," she tells us.